Dear Cloudroid players, I have received many emails and comments asking ‘Why can’t I move my piece as I want?’ The answer to the question is : It is the checker’s game rule. You can read checker’s game rule here. However, I do understand there are many variants of checkers. I will make an option so you can select to play with mandatory jump or not. Please don’t rate my game 1 star just because of the mandatory jump. Thank you. 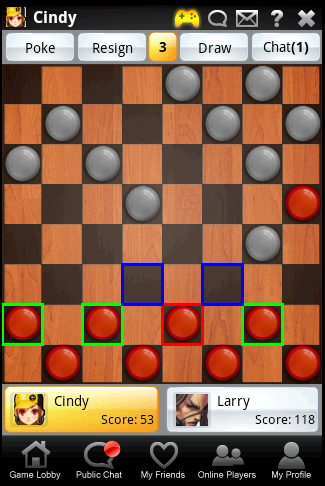 Checkers Online over 10,000 downloads! Since I accidentally deleted the signature key file for my Checkers Online game, and for some reason Google won’t let developers to delete applications, I had to upload a new one and unpublish the old one which means you won’t be able to update the game from Market directly. Instead, you would have to uninstall the old Checkers game and go to market to download and install the new one again. Really sorry for the trouble. 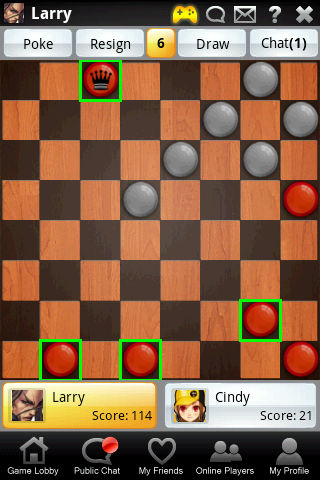 Checkers Online 1.1 is released in Market for those checkers lovers. A user-friendly UI and easy game play style. The game comes with timer and non-timer modes. You can also poke your opponent or resign during gaming. Many similar features as Chess Online. Enjoy!